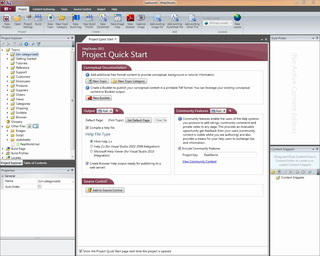 A HelpStudio project can contain any number of PDF Booklets. The PDF Booklet Editor is used to define the content and properties of a specific Booklet that you wish to generate. Easily add members to the booklet by dragging and dropping them from the Project Explorer or Table of Contents, or simply re-use the Table of Contents layout from your online ouptut. Set Booklet properties to define the paper size, image quality, Booklet title and other options. Use the Hyperlink Conversion options to customize the standard Hyperlink Conversion functionality that HelpStudio uses to make hyperlinks in booklet content readable in a printed medium.